*Note: we previously looked at Cruciformity here, and Inhabiting the Cruciform God here. 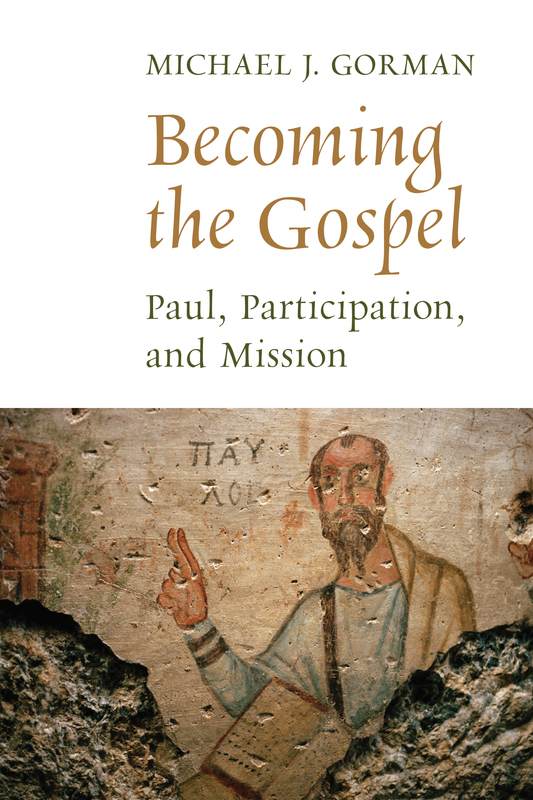 Michael Gorman’s 2015 book, Becoming the Gospel, takes an illuminating look at Paul’s perspective on the Church’s participation in the mission of God (missio Dei). It forms the final entry in what Gorman calls a “partly accidental” trilogy—the first book being Cruciformity (2001) and the second Inhabiting the Cruciform God (2009) (pp.2-3). In Cruciformity, Gorman argued that the cruciform, self-giving love of Christ found in Paul’s writings, and especially expressed in the Philippian Christ Hymn (Phil. 2:6-11), formed the center of both Paul’s theology and spirituality. Inhabiting the Cruciform God extended the main argument of Cruciformity by seeking to show that, “For Paul, to be one with Christ is to be one with God; to be like Christ is to be like God,” meaning that “for Paul cruciformity… is really theoformity, or theosis” (Inhabiting the Cruciform God, p.4). Starting from this premise, he developed a reading of Paul’s letters that weaved together the (sometimes) seemingly opposed frameworks of legal/forensic and participatory understandings of justification and salvation, arguing that far from being opposed to one another, these forensic and participatory categories are more like two sides of the same coin. Therefore, one can say that justification in Paul can also be understood as the beginning of “an experience of participating in Christ’s resurrection life that is effected by co-crucifixion with him” (Inhabiting the Cruciform God, p.40). Gorman suggested that this reality of transformation through participation in the “character of God through Spirit-enabled conformity to the incarnate, crucified, and resurrected/glorified Christ” can be appropriately described with the traditionally Orthodox language of theosis (Inhabiting the Cruciform God, p.162). Now, in the pages of Becoming the Gospel, he uses the interpretative framework developed throughout the first two volumes of his trilogy to read Paul’s letters with a missional hermeneutic, attempting to show that “because Paul expects the church to embody the gospel… its very identity is inherently missional” (p.18). Gorman finds Paul’s perspective on the role of the Church in the missio Dei to be quite similar to that of British theologian John Colwell, who writes that, “Through its service and being as witness, the Church is a rendering of the gospel to the world” (Living the Christian Story, p.85). What does it look like to read Paul missionally? It means approaching the text with questions like, “How do we read Paul for what he says about the missio Dei and about our participation in it?” (p.12). For those of us who embrace Paul’s writings as Scripture, it also entails asking, “How does God expect us who read Paul’s letters to participate in the missio Dei?” (p.58). What did Paul think about the mission of God in the world? Gorman thinks the answer to this is actually quite clear: for Paul, the mission of God was to bring forgiveness and salvation to the world, and to liberate humanity and the rest of the cosmos from the power of Sin and Death (Rom. 1:16; Rom. 8:2) (pp.23-24). As we have noted before, Gorman believes that salvation in Paul has an important participatory nature; he finds the concept of “union with Christ” to be important. One of the ways in which he supports this assertion is by pointing out Pauline passages (like 2 Cor. 3:18; 2 Cor. 5:21; and Rom. 12:1-2), which speak of those “in Christ” being transformed into the image of Christ through the work of the Spirit. Gorman shows that these themes of “participation, new creation, and transformation” all come together when Paul tells the Corinthians first that “if anyone is in Christ, there is a new creation: everything old has passed away” (2 Cor. 5:17, NRSV) and secondly, “For our sake he made him to be sin who knew no sin, so that in him we might become the righteousness of God” (2. Cor. 5:21, NRSV) (p.32). He explains, “Participation in God’s new creation means, once again, transformation… To become the righteousness/justice of God is to be transformed into the image of God, which is to become like Christ by being in Christ” (p.32). This language can come across to some, unfortunately, as being overly “vertical,” more concerned with inner transformation than with witnessing to the surrounding world. Gorman pushes back against this sentiment, asserting that, “‘Participation’ doesn’t mean a ‘holy huddle'” (p.35). Of course, Gorman would also suggest that “inward-focused” and “outward-focused” activities are intimately connected together in a healthy community of believers. Given the importance of Philippians in Gorman’s work on Paul, it only seems right that we turn to his perspective on the missional implications of the Christ Hymn in Phil. 2:6-11 before closing with a few final thoughts on the book. The poetic narrative found in Phil. 2:6-11 has figured prominently in Gorman’s writings for a long time. Back when he wrote Cruciformity, it was foundational for his understanding of Paul’s “narrative spirituality.” Now, in Becoming the Gospel, he again affirms that this passage is the “theological centerpiece” of the letter (p.108). What are some of the implications of these verses for the internal and external missional life of the Church? That is what Gorman wants to explore here. In addition to Paul’s letter to the Philippians, Gorman also works through 1 Thessalonians, Ephesians, 1 & 2 Corinthians, and Romans. His section on Romans is especially in depth because in it he attempts to demonstrate the need for adding participation/theosis to the list of other traditionally important themes recognized in the letter (like justification, the righteousness of God, the obedience of faith etc.) (pp.261, 268). For Gorman, the overarching idea of being conformed into the cruciform image of Christ by participation in the empowering work of the Spirit is an important way of thinking about the long haul of growing up in Christ, even if one avoids using the language of theosis/Christosis to describe it. The thesis of the present book is precisely the opposite: theosis—Spirit-enabled transformative participation in the life and character of God revealed in the crucified and resurrected Messiah Jesus—is the starting point of mission and is, in fact, its proper theological framework… being and act, life and mission, belong together both for God and for the church. (pp.4-5). So now, as we reach the end of this review, we can step back and reflect on how Gorman has fleshed out his response to these concerns. The basic thesis of the book—that Paul wanted his readers to “embody” the gospel not just to “believe” it—is not in itself too controversial. It doesn’t seem to me that difficult to get people to agree that believers shouldn’t merely give intellectual assent to the gospel but should embrace it with both mind, hand, and heart (one hears echoes of Vanhoozer here). The second leap in his argument is to show that “embodying” the gospel is inherently missional. It seems to me that Gorman’s strongest move is in showing that this language of “embodying the gospel”, just like Paul’s language of being “baptized with Christ,” “crucified with Christ,” and “clothed with Christ” has an inherent participatory dimension. That doesn’t mean that legal/forensic understandings of justification/salvation must now be marginalized—far from it. However, I suggest that it shows the inadequacy of those who interpret Paul using only a forensic lens. Paul used both legal and participatory metaphors for justification and salvation, and both are needed. Becoming the Gospel persuasively supports his overall argument regarding the importance of participation in Paul, and does much to flesh out how these themes relate to the world of missional hermeneutics. Even for those who disagree with him, reading Gorman is a deepening experience of wrestling with the meaning of Paul’s letters in conversation with a theologian who deeply loves them. I definitely recommend it. This entry was posted in Book Reviews and tagged Cruciformity, Justification, Michael Gorman, Missional Hermeneutics, Paul, Spirituality, theology by joecrow91. Bookmark the permalink.